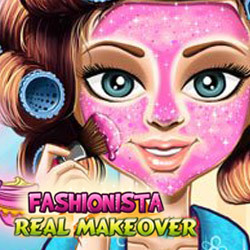 Description: Shopping is this girl's dream, but she can't go out without a real makeover session first! Her morning routine begins with a relaxing spa session, the beauty masks that make her face clean and soft are simply a must do. Don't underestimate the power of colorful eyeshadow, blush or eyeliner, make up and clothes can make her look even beautiful than before. Choosing a great outfit isn't easy, after all we are dealing with a fashion lover! Try on sparkly dresses, exquisite accessories and find the look with that "wow" factor that everybody loves!